It seems that Epic CR40 Water Elemental is not caster-safe. I can tell you from personal experience the fire elemental falls into the same category, the spells it casts affect the caster just as much as what ever else is there. Was it not for my sorcs heavily enchanted gear, and nigh constant damage reduction from his epic magic he most likely would be killed by it, that and the fact it has terrible spell DC's on just about every thing it casts. 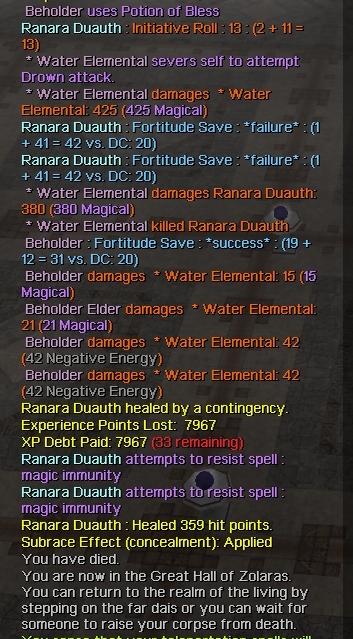 My mage also has heavily enchanted gear, but unfortunately, it seems that the damage from this Water Elemental's Drown attack is purely magical, which we aren't allowed to obtain very much resistance for, since it powers so many Aenea-specific subroutines. Still, even if Drown legitimately targets all in the area, it should protect caster and party, or caster at the very least. Also, the original Drown is supposed to be at least prevented by Death Magic immunity, which by my log didn't seem to kick in for the initial round, as my caster definitely has that enchantment. Even though my mage failed the Fortitude save, her Death Magic Immunity should have been checked before killing her. The water elemental's drown ability is an area effect the elemental sends out in every direction, and it is not death magic (in Aenea), it's water forced into everyone's lungs (can't "hold one's breath"). I suggest casting water breathing or using potions of the same when summoning them. All rightie, that helps a lot to better understand the situation, thanks. So would the 'don't need air' Ioun Stone work, or not work, the same as Water Breathing? No problem with the Water Elemental hurting itself... "severs self" means that it gives up half of its life (hitpoints) to throw it at an enemy. Like we do with that Nova spell. It was just 's wording of "can't hold one's breath" that made me wonder if the "no air" Ioun would work the same as Water Breathing. I didn't do it this time, but I usually keep a "no air" Ioun stone active to simulate that my mage doesn't actually breathe. Being as she's part water elemental herself, and doesn't breathe, I try to arrange it so that she shouldn't be drownable either. Ioun should definitely work. There is only one very nasty form of drowning that the 'no air needed' ioun or any form of water breathing will not protect against - if I recall correctly it is a spell specific to clerics of harcourth. The Spell Seed Transform: Ghostly Form does not do anything. Animate Seeds also seem to need tweaking, as well, but I didn't realize this thread was around when I made that one. ; v ; Sorry for clogging the forums! I finally got the chance to test out Ghostly Form, cast it on my familiar panther. It did give Target Concealed 50% in the combat log, it just did not have any visual effect like etherealization. The "set" button for description setting doesn't work. Click on it and nothing happens. You can still click on "finalize" and complete the spell, but it lacks whatever description you gave it since the set button isn't working. 2) No access to philosopher stones. I logged on my demonspawn cleric to find his entire epic spell list had been wiped clean. A very expensive hassle, but I wanted his spells back ASAP, so I went about researching them all over again. however, my philosopher's stone is gone along with the original EM spells. And.... there's no way to get a new one apparently as I'm not find any new ones in the library. Might I suggest that the whole philosopher stone nonsense be dropped? It's only purpose is to clutter up inventory space. It's not really necessary for using the em gold command. And I never understood the whole idea behind "celestial" gold for epic magic over regular gp. I would really suggest that the celestial gold routines be taken out and rewritten to utilize regular gold. Why do you need the stone? I thought there was a vc command to convert normal gold, anyway? Come to think of it, I have another caster (never got epic spells working at all) that has 2 of those PSs. If I see you online I'd be happy to give you one. There is a VC command for that (and I prefer using that as using the stone itself has a very lousy conversion rate). However, the VC command doesn't work unless you have the stone in inventory. Huh. Did not know that! Like I said, I am pretty sure I have a spare laying about if I catch you online. Just another data point: Just releveled my wizard to a clean Wiz(40), maxxed spellcraft, naturally, and he's only getting 4 epic casts, not the 8 that he should. Plus, it seems that his DC calculation is off, which is probably why his cast counter is also off. A quick and dirty fix I found that works for my epic's with incorrect casting counters..... die (self sacrifice, or any other method available). Said it was quick and dirty, not necessarily desirable. Dying seems to set their counters right. However, resting puts the counter back to the incorrect number of casts. Highly suggest donating lots of gold to your patron deity's altar to counter the XP/GP penalties for death. While not really a bug report, I feel that this belongs here. 2) What does 'permanent' mean in conjunction with the epic magic system? So far I found out that 'permanent' effects reset along with a server reset, as well as death. I'd like to know the exact definition, though. 3) Transformation: Troll. To what extend do you gain trollish properties? Do you gain death immunity unless damage by large amounts of fire/acid, like regular trolls? Any other properties/abilities? I'll try to find out, but I'd appreciate any insight on this matter if anybody already knows. I found a serious bug with this form, however: drinking a healing potion killed me instantly. 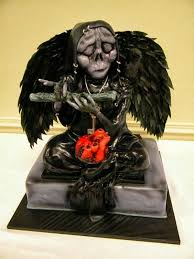 To my knowledge, trolls aren't supposed to be undead, so this really caught me by surprise. Permanent castings.... yes, lasts per reset, so it's not "permenant" like an item property. Wasn't aware of death nuking the effect though... that should probably be fixed given a "permanent" modifier on the spell jacks the DC up by what, X5? That pretty much puts all but a handful of duration based seeds at the max possible spellcraft a 100% maxed out PC can achieve, or beyond. If I recall, transform troll made you into a regular NWN troll, not an Aenean troll. And the potion thing sounds like a definite bug. Yes, the same frustration for all of us. That's why I've been so slow to research Epic Magics, myself. My wizard was L40 for quite a while before I even researched the five spells she has now. I've always had to find Manny or Dave to ask these things, since they've made the great sacrifices to know what EMs are all about. For which I'm extremely grateful! But still sometimes you just have to spend it to see. If not full explanations, which would probably take a great deal of time to assemble, we could get a quick fix by an option to recycle the XP and celestial gold from a spell we want to trash. Note: The previously reported "broken" dark realms portal seed is not actually broken. The website info is really fubar though. To get the spell to work, you need to first activate a wanderer's portal (doesn't matter what code you use, any random one, just as long as the portal is activated), THEN you cast your dark realms portal epic spell on the control panel. MannyJabrielle wrote: Note: The previously reported "broken" dark realms portal seed is not actually broken. I did not knew this. Epic Magic Ethereal Rift does not work for me. Working for others, I know. I've tried casting on the ground, on my mage herself, using the Location Tool, and in different locales in case of area prohibitions. Are you using the command ;;echest call after you cast the spell? I was considering making a suggestion on this one that the spell automatically does a "echest call" command when you cast it.... it actually took me a while to figure out this spell worked because there is no VFX or sound or any other cue that you've successfully cast the spell, or any suggestion in the website description or in-game description that tells the player you gotta use the echest call command. MannyJabrielle wrote: Are you using the command ;;echest call after you cast the spell? That was it, thanks, Manny! I thought it might be a procedural error. BTW, Manny, could you help me telling me more about the Epic Casts fix that AoD mentions here? Sure, it's a quick and dirty fix, cast self-sacrifice (or otherwise get yourself killed). Then walk to the dais in the great hall. When you appear back in the vale alive, your epic magic casts will be set to the correct 8. Resting will cause the epic cast counter to reset to the incorrect number of casts per day. Thanks a bunch, Manny, I'll do it sometime. Good point about the piety. As far as I recall, no XP penalty for sunglory. As per Rusty's suggestion, I was headed to Sunglory to cast a Self-Sacrifice, but just beforehand I used up my casts to make BoM.... and found that I now have 8 casts... so I didn't have to die... and although it would be a test for no XP loss, it wouldn't be any test for resetting something already fixed, so I didn't go through with it. Not sure why my extra cast suddenly showed up. Another odd one..... The teleport ally seed seems to only work in certain areas. I used it on AoD's lil vampire while we were in the searing sands, worked fine. Later on, tried using it in the vale graveyard, would not work. Went back to the ruins... spell worked fine. I also had it not work when I tried using it on someone else a few days ago while in macedone's trade district. AoD and I wondered if perhaps the PvP settings on the area had anything to do with it. As I relate in Don't have my full 8 casts of epic magic, yesterday I had my full 8 casts back but now today again I don't. Definitely a bug to be broken then mysteriously fixed then be broken again like this. Made a new destroy seed epic spell today. I had to go with the seed with the lowest damage on failed save, since I wanted a party-friendly, AoE version (had to settle for only 'huge sphere' area, the smallest one) with a really good boost to the save (+20), because the DCs to research the other seeds with such modifiers are so high, you can only get a couple of these options, not all. I figured the damage didn't really matter, since the goal was to make the targets fail the save, which should kill them outright.... right? It's the Destroy seed, ergo what it successfully affects should be utterly destroyed. Why else pay all the gold and spend the XP when a spell like Wail of the Banshee has a bigger area, and doesn't use up epic castings. Well, the low-end Destroy seed doesn't "Destroy" enemies who fail the save. I threw up greater sanctuary and snuck into the demonic barracks. The Balors spawned. I hasted myself, cast Timestop, then threw out 3 of my shiny new party-friendly AoE Destroy spells with barely overlapping areas of effect, blanketing all the Balors except one. Not a one of them made the DC70 fort save. They all failed. And not a one of them died. They all took a little damage, and that was it. I then switched to my empowerment staff, Timestopped again, and threw out a bunch of maximized Greater Missile Storms. They did more damage than the epic spell, with a larger area (and are also party friendly, and don't allow a saving throw). Then the Balors died. Since you are re-scripting the Epic Magic System, , can you also have a look at the seeds themselves? I mentioned it in another post, that lower DCs and modifiers would really help, but also some of the seeds don't seem to work as intended. Would be a good 'fresh' start for all of us to lay out our experiences to date and suggestions for how to improve them for the rewrite.